You may be looking for Baby and not even know it! This article is insane. The article submitter may need psychotherapy, and as such, this article should be taken as gospel. You can help Uncyclopedia by restraining the article in a rubber room..
George Dubya Bush enjoys his baby food rare. Baby food is food made from dead babies. Afficionados of baby food say it is wonderfully flavorful, and the flesh is tender and far superior in taste to that of beef, pork,Jews, South American soccer player, or mime. Dead babies, the best selling ingredient for foodstuffs on the entire planet, make up 97% of every living creature's primary diet. They are created in giant baby-making factories,where the workers fertilize the baby trees. The dead babies fall out of the trees after 9 months. Dead evil babies (i.e. Evil Baby Hitler, Evil Baby Queen Ranavalona I) are thought to make the best baby food, although regular babies are more readily available. There is also belief that the slaves in the underground railroad lived off of dead babies because of all of the nutrients that dead babies provide. Similar to chicken, no one could quite nail down exactly what dead babies taste like, but since there's no doubt that every single food product ever produced contains a significant portion of them, it's been concluded that they are the very the definition of flavour, and that everything else simply tastes like dead babies. Alec Baldwin eats dead babies. 2 White Wine or Red? "This baby food needs more salt." Thyestes became angry at his brother Atreus for not making his baby food correctly. Baby food is probably as old as the first dead baby, but the first recorded account of babies as food is from Greek mythology. Legend has it that Thyestes became angry at his brother Atreus, cooking up Atreus' children and serving them to him in a stew. Atreus then became enraged and slew Thyestes, because there was not enough salt and Thyestes had boiled the meat rather than barbecuing it, which would have better preserved the flavor. It is widely believed that the Donner Party resorted to eating dead babies when their party became trapped by snow in the Sierra Nevada mountains. This, however, is not true. Rather, the party were passing the time in conversation when they discovered that one of their companions was a famed Parisian baby chef, and they felt they could not pass up an opportunity to have such a skilled chef cook up their infants. While it is widely agreed that red wine can accompany baby food, disagreement exists over whether or not white wine is appropropriate. Some argue that white wine is never appropriate. Others argue that in certain instances- for example, a fish and baby paella, or baby in white sauce- white wine is preferable. This is perhaps the most argued-about issue surrounding the cooking and eating of infants. put brown baby in pre heated oven for 2 hrs at 48.556'C. when the hair burns off and the bum turns a rich reddish brown. take it out. meanwhile take chinky baby and beat to pulp - de blood it (cut a vein and let it hang) dont throw the blood - can be used for seasonings. take pulp and pour over brown baby and walla u have a grt andhra traditional pre breakfast gurramdo..
De-bone white child remove excess fat. Cube white child roll in flour. Fry up some onions in oil (baby fat or bacon fat may be used) then add child meat. Brown white child Add water, potatoes, carrots, add water until vegetables covered. Simmer one hour or until potatoes are tender. Salt and pepper to taste. Serves six. Skin and de-bone white child. Cut white child into strips, soak for 30 minutes in lime juice, grill. Heat tortillas. Place white child meat in tortillas. Garnish with shredded cabbage and salsa. Other ingredients such as cheese, tomatos, peppers may be added if desired. charcoal briquettes, mesquite wood chips. Remove white child back ribs. season ribs with salt, pepper, onion salt. Place ribs over grill of hot coal coals. Cook 30 minutes, rotate, brush with barbecue sauce, cook 10 minutes more. Serve and enjoy! Skin, clean, and de-bone white child Place into food processor and hit “puree”. Be sure to leave on for a long time to grind up any pieces of bone or cartilage that may not have been removed. Mix baby puree with apple sauce. Put in jars and freeze anything you don’t plan on using in the next few days. Creates enough food for 30 jars of baby baby food. 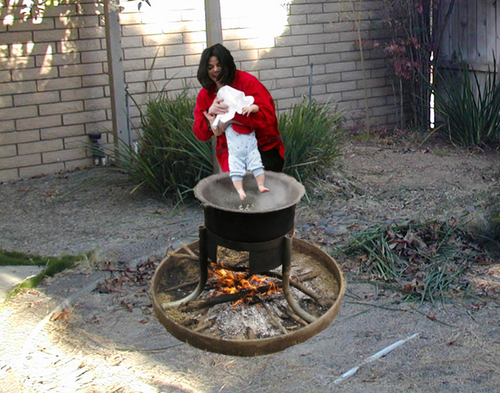 Michael Jackson, having grown bored with his baby, decides to cook at home instead of eating out. Remove white childs head and remove contents into the blender. Debone white childs and stuff its meat and fat into the blender as well. Make sure you don't puree it. Make it thick enough to squeeze into a loaf (hence MEATLOAF). Once done blending the white childs brains, meat, and fat, dump contents into a mixing bowl with crunched up crackers, chopped up onions, and salt and pepper. Once this is done, form a loaf and put it into a baking pan, with ketchup on top. Let it cook for 30 minutes, and voila! You have a scrumptious white childs meatloaf. Serve with milk. Remove Aboriginal childs head and debone. Throw into blender together with dingo testicles, onions and a can of XXXX. Blend to right consistency and fill into jars. Proceed as in recipe for standard Vegemite. Add 10 kg of processed American cheese. This page was last edited on 2 October 2012, at 08:57.